Testimonials | Shannon Boats. Boat Builder in Taree. See details on the Fission 500, Kayaks and Pulling Boats. Thanks for the opportunity of a test run in your Fission 500. What a boat! After a lifetime in so many hulls of that type and purpose, I’ve a pretty good idea of what works and what doesn’t. To say that I am impressed is an understatement. I will be due next year to seek a replacement for my existing workboat. I will be in touch later this year to discuss a purchase. 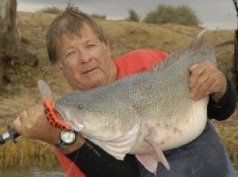 Rod Harrison is one of Australia’s most respected fly fisherman and anglers. “Barra” is the culmination of Rod Harrison’s passion for Barramundi. It is the definitive book on Australia’s premier and world renowned sportfish. In his incisive yet laid back trademark style Harro reveals everything that you would want to know about barramundi and fishing for them. Staring with a background on Barramundi biology and distribution, Harro gives detailed information on where in Australia they can be found, and details the techniques and tackle to use – everything that you need to know to catch them. Fantastic photography and illustrations by Trevor Hawkins, “Barra” is an authorative reference work and a necessity for anyone who dreams of catching this elusive sports fish. 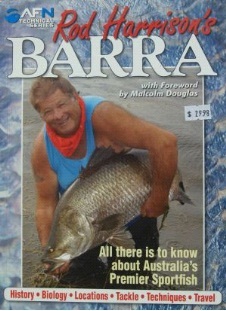 Rod Harrison started catching and writing about barramundi when they were still known as Palmer Perch. Since then he has fished for barra and their close relatives all over the world. Along the way Harro has been on the cutting edge in the development and refinement of lures flies lines and rigs, and has always been the leader in the new techniques and rod work. Harro is as much an icon as the fish that he knows and loves so well. This is a worthy addition to any keen fisho’s library, and will be a keenly sought after text book and ‘how to ” manual. Rod Harrison (Harro) has the rare distinction of being known throughout the fly-fishing world by his nickname. The first non-American to be appointed to the Sage advisory staff, Harro has fished on five continents and in four oceans. His thoroughly researched and entertaining writings have been published in a number of languages. He also served on the Rio advisory staff until founder Jim Vincent sold the company. These days, other than his own boutique product, Bionic braid, a World leading, Australian made dyneema backing and lure fishing line, Rod remains unaligned. His barramundi experiences have taken him through their known world and includes guiding stints in Arnhem Land, the Kimberley and Gulf of Papua. He has been fishing at Lake Awoonga since 1993 and in two (and final) tournament appearances there, placings include a win and runner-up for his two man team. I bought the prototype FISSION 500 a few years ago and have covered a lot of miles in the boat since. A couple of trips to the Queensland impoundment lakes Awoonga and Monduran have seen some impressive Barra’ hauled aboard. We fished these dams at night in some very adverse weather conditions and despite the comparatively low freeboard, felt completely safe. Back home on Wallis Lake at Forster on the mid-north coast of NSW the boat also really shines – drifting incredibly shallow flats for trophy Flathead. I’m a 54 year old mad keen fisherman and after owning this boat, I would never consider buying any other type of boat. The sheer fishability and performance of this boat has to be experienced to be believed. Quite simply, the FISSION 500 is easily the best boat I’ve ever owned – and I’ve had a few! I would like to thankyou for spending the time to take me for a test drive on the Fission 500, I am happy to say that your product performed far greater than any other boat I have put to the test, also the stability and performance of your vessel is perfect for our fishing charters business which is what we intend using it for. Can you please send through a Quote on the Fission 500 as we would like to purchase a boat before the Barra season starts. Rob Howell is a fully qualified Shipwright / Boatbuilder who served his apprenticeship at River Quays Marina, Sydney Harbour. He has spent most of his working life building boats for some of Australias leading manufacturers before opting for a lifestyle change. He now runs the Lake Monduran Caravan Park and his own Barra guiding business. Park Manager Rob Howell also runs the onsite fishing guide known as GUIDELINES FISHING CHARTERS. Rob is an experienced freshwater angler with extensive knowledge on Lake Monduran and operates out of a 475 Hornet Wildfisher boat with a 75hp Mercury outboard to get you to the hotspots in a hurry. This service offers the angler the best possible chance of catching a Barramundi of Bass with Rob teaching you the correct techniques, showing you the right environment to look for and the correct equipment to use. For the experienced angler in Freshwater fishing, Rob is there to give you the good oil on where the fish are biting and what lures are working well as he is out there every day. Rob’s prices are $75.00 per hour for 2 people and $85.00 per hour for 3 people with a minimum of 3 hours. He supplies all fishing gear, so just hop onboard with your lunch and refreshments and get ready for some Barramundi action. PHONE: 07 4157 3881 for bookings. Rob Howell runs Guidelines Charter Fishing on Lake Monduran. Rob also runs the Lake Monduran Holiday Park and is always up to date with what is happening in his back yard. You can hire Guidelines for a half day, full day or consecutive days depending on your requirements but we found having Rob come out and show us around did wonders for our confidence. Rob unashamedly wants people to catch fish. He reckons if a visitor catches a barra they will come back and Guidelines can certainly help you do that. Rob does not guarantee you will catch a fish, as no guide should, but what he offers is the opportunity to learn where and how to catch a fish. This to me is the most important ingredient in a guiding operation as I want to learn how to and Rob offers general areas where the fish are biting. On our trip Rob showed us some shallow water luring techniques that were spot on. While we were following Rob and the two boys on his boat around we saw them miss three fish including one spectacular jump off. We used Rob’s locations and information to land most of our fish for the trip, so that is where the value of Guideline is found. I also like Rob’s general feeling about information. He insists there are no secret spots, secret lures or secret retrieves. He will tell you everything he can to get you onto a fish and even show you if you book with him. Contact: Rob at the Lake Monduran Holiday Park on 07 4157 3881 to book some time with Guidelines.